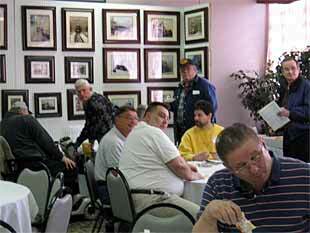 In mid-March 2005, I presented this one-hour clinic at the Pittsburgh Jamboree, sponsored by NMRA MidCentral Region Division 2. It was well-received by the members in attendance, and I thought you might like to see some of the slides I used. So here is an assortment extracted from the 20+ transparencies that were prepared for the presentation. The remainder were largely examples of various types of Micro Layouts, drawn directly from material on this site, so are not repeated here. 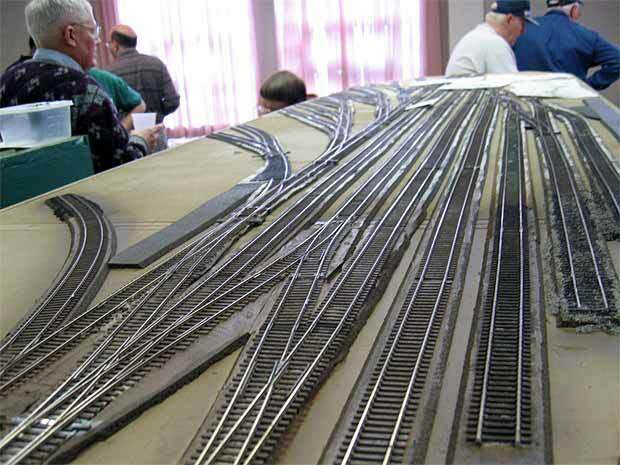 The clinic began with a definition of micro layouts, emphasizing the fact that they are usually less than four square feet in area and that they represent a self-contained, working railroad. They can be made in any scale and any shape or size, so long as they don’t exceed 576 square inches. 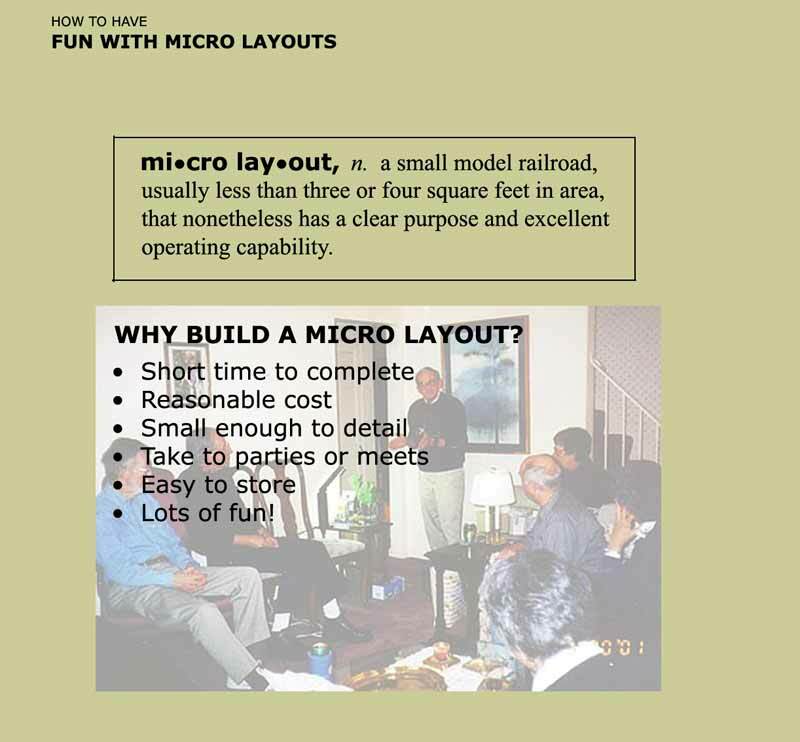 Some things that Micro Layouts are not: they’re not 1:900 scale toys, nor dioramas, nor modules that assemble into larger layouts. Bill Nunn’s Carl’s Exports, an indoor G railroad on a small shelf. 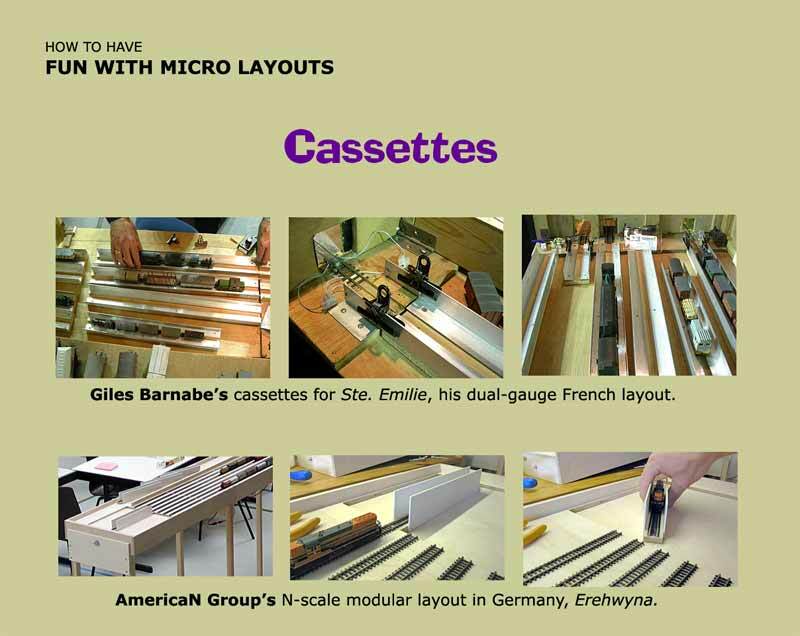 After illustrating several micro layout designs that will be familiar to readers of this site, the presentation showed tips on how to construct some of the elements of a micro layout that are “different” from the usual. 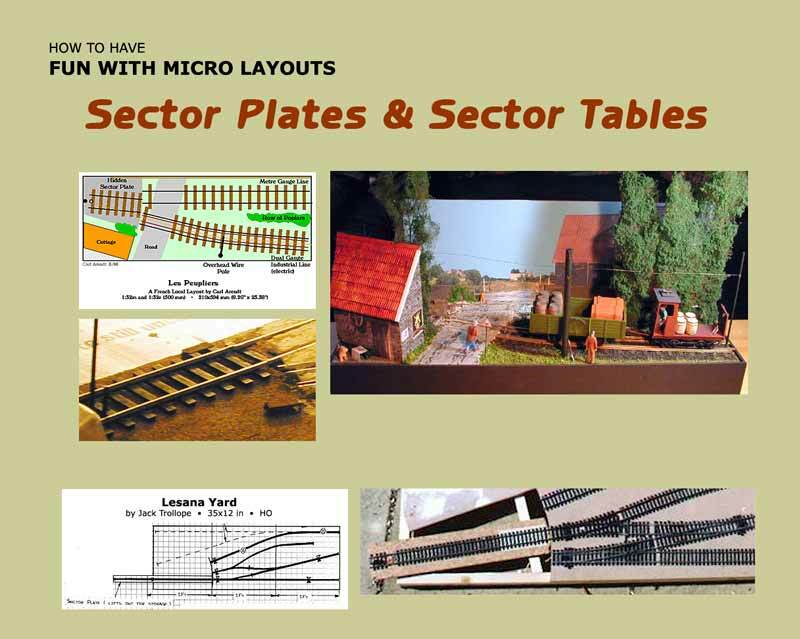 First up were Sector Plates and Sector Tables — both short ones (as in Les Peupliers) and long ones (as in Lesana Yard). The difference: when pivoted at the end, they’re Sector Plates; pivoting in the middle makes them Sector Tables. 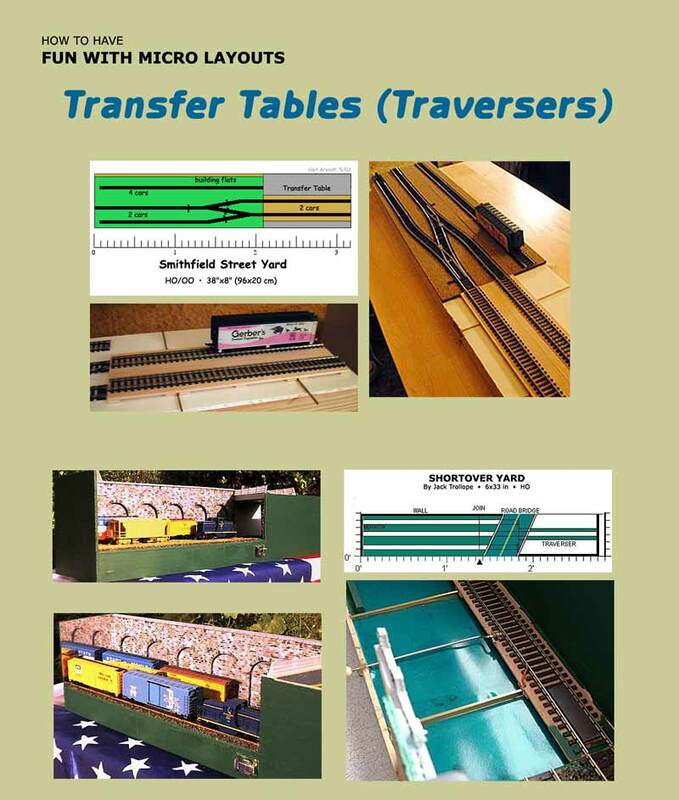 Transfer Tables, while not a new idea to U.S. rails, are not a familiar part of fiddle yards or backstage activities. The presentation illustrated some easy ways to make tables that slide on metal rails and get their current from them as well. I invented this idea, and Jack Trollope engineered it to work properly. Both of us illustrated the idea with designs for very small layouts — Smithfield Street Yard and Shortover Yard. Cassettes are almost unknown in the U.S. as a method for making backstage maneuvers easy, quick, and natural. This section introduced the idea, as epitomized by Giles Barnabe’s large and busy fiddle yard in his wonderful layout, Ste. Emilie (photographed by David Thomas). The AmericaN Group’s locomotive-turning cassettes are another good application of this very useful concept. 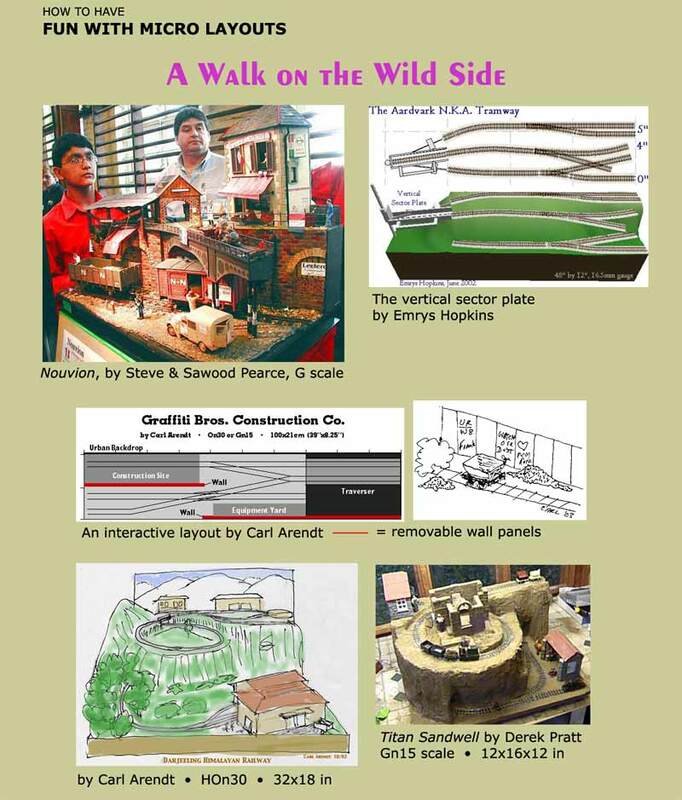 the idea of a working helix with a 6-inch radius contained in a micro layout — I designed it in order to represent the amazing Darjeeling Himalayan RR in India, and that sketch inspired Derek Pratt to actually build a hidden helix on his pike! 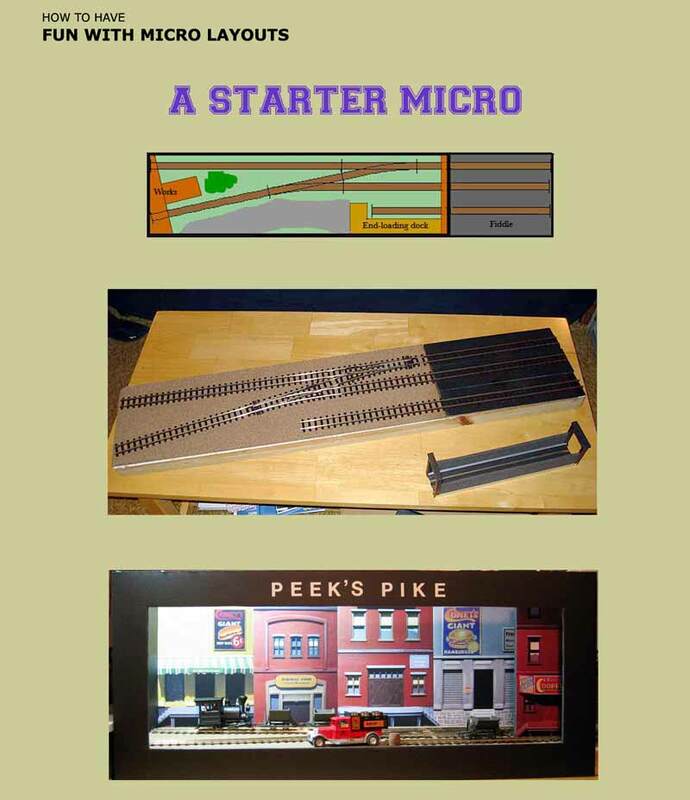 The presentation concluded with a “live” demonstration of a micro layout, Peek’s Pike, which was presented as a “work in progress”. Beginning with plain track fastened to a foamcore baseboard measuring 1000×210 mm (about 39×8 in), we showed off the Peco Loco Lift (see center photo) which in On30 with four-wheeled cars can be used as a very effective backstage cassette. Finally, mocked-up scenery was added, piece by piece, including a computer-printed backdrop and a proscenium frame of black foamcore (bottom picture). Backdrop was made from photos of structure models by Elfin Models. 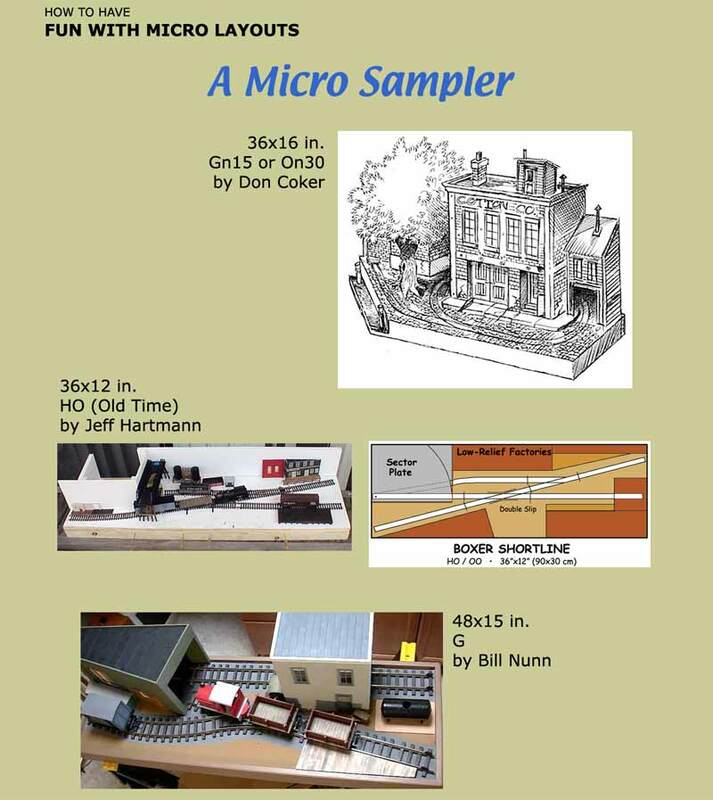 Overall, a lot of interest in micro layouts was generated! For a step-by-step construction article of building this pike, click here. Note: Peek’s Pike won 2nd prize in the Small Layout Design Yahoo group’s Summer 2005 design challenge.